Marostica is a medieval town, located in province of Vicenza, northern Italy, (90 km from Venice). Mostly famous for its spectacular event and folkloristic tradition The Human Game Chess which takes place in the town’s square in the second weekend of September. It’s a tradition started in 1923 inspired by an event from 1454. For this historic event, Marostica is also nicknamed ‘ La Città degli Scacchi ‘ - ‘The City of Chess ’. I remember being very excited about this event because it was definitely something new for me. I wasn’t born in Italy but while living here I’ve learned and heard many stories, seen beautiful places - it’s a perfect place for my wanderlust soul that craves new things, adventures, stories and amazing places. That night I got the idea of the event but I barely understood something because they spoke in dialect or an antic Italian … but I’ve done my research afterward.. The story is about Rinaldo d’Angarano and Vieri da Vallonara, two noble warriors who fell in love with Lionara, daughter of Taddeo Parisio, governor of the town, and, as was the custom of that time they decided to compete in a bloody duel. Parisio, a great Humanist forbade the two ardent lovers to fight for his daughter’s hand, and suggested instead that the contest should be resolved by a game of chess. Both young men were experts at the game; to console the loser, Parisio promise to allow him to marry his sister Oldrada. The meeting took place on a day of celebration in the square of the Lower Castle, with humans, noble ensigns of whites and blacks in the presence of the Lord, his noble daughter, the Lords of Angarano and Vallonara, the nobles and the people around. He also decided the challenge should be honored by an exhibition of armed men, cavalry and fireworks, dances and music. The game was played on September 12th, Vieri da Vallonara won and according to the chronicles, it was Lionora’s favorite. 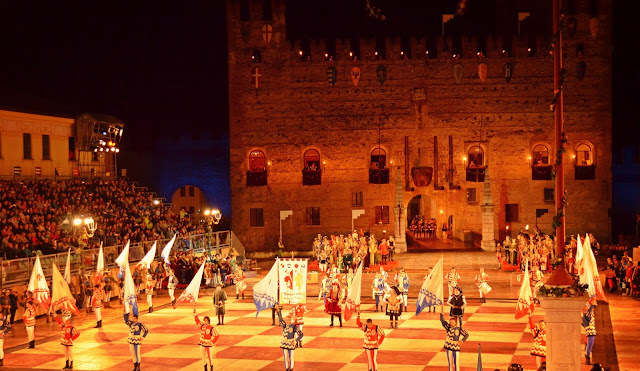 Since then, Marostica relives that singular adventure, faithfully reconstructing the atmosphere and the customs of the time, with over 300 participants, men and women, and chess champions to move the pieces on the square . I love this amazing story and decided to share it. I admire Parisio’s wise decision about not letting the two young men fight in a bloody duel and glad that Lionora’s favorite won.. the perfect Happy Ending.